Originally published under the title "Defeating Radical Islam: How a New White House Initiative Can Get the Job Done." Speaking in Youngstown, Ohio on August 15, 2016, President Trump pledged to establish "a commission on radical Islam" if elected president. Who is the enemy? It's been over 15 years since 9/11 and still this fundamental question rattles around. Prominent answers have included evil doers, violent extremists, terrorists, Muslims, and Islamists. As an example of how not to answer this question, the Obama administration convened a Countering Violent Extremism (CVE) Working Group in 2010 and included participants who turned up such gems as: "Jihad as holy war is a European invention," the caliphate's return is "inevitable," Sharia (Islamic law) is "misunderstood," and "Islamic terrorism is a contradiction in terms ... because terrorism is not Islamic by definition." The result? The group produced propaganda helpful to the (unnamed) enemy. In contrast, then-candidate Donald Trump gave a robust speech in August 2016 on how he, as president, would "Make America Safe Again." In it, he pledged, "One of my first acts as president will be to establish a commission on radical Islam." Note: he said radical Islam, not some euphemism like violent extremism. The goal of that commission, he said, "will be to identify and explain to the American public the core convictions and beliefs of radical Islam, to identify the warning signs of radicalization, and to expose the networks in our society that support radicalization." How not to do it: The White House Summit to Counter Violent Extremism, starring Barack Obama. The commission "will include reformist voices in the Muslim community" with the goal to "develop new protocols for local police officers, federal investigators, and immigration screeners." On Feb. 2, Reuters reported that, consistent with the August statement, the Trump administration "wants to revamp and rename" Obama's old CVE effort to focus solely on Islamism. Symbolic of this change, the name Countering Violent Extremism will be changed to "Countering Radical Islamic Extremism" (or a near equivalent). To be successful, all the commission's members must be selected by the president. Structure. To be successful, all its members must be selected by the president. Too many commissions have included contrasting ideologies and agendas, grinding out sausage-like self-conflicting reports that displease the administration and end up discarded. Also, learning from the struggles of the Tower Commission, which lacked sufficient powers, and the precedent of the Three Mile Island Commission, which actually had them, the commission needs the power to subpoena documents, compel testimony, and grant immunity. Personnel. The commission should include a mix of experts on political violence and radical Islam, as well as elected officials, representatives of law enforcement, the military, the intelligence and diplomatic communities, technology specialists, Muslim reformers (as the president insisted), and victims of radical Islam. It should also include liaisons to those who ultimately will implement the commission's recommendations: secretaries of the departments of state, defense, and homeland security, the attorney general, and the CIA director. 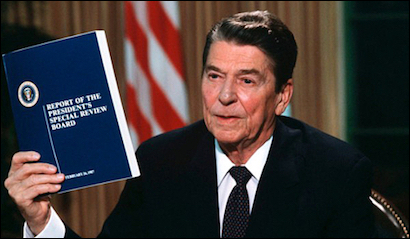 Another way not to do it: Ronald Reagan and the Tower Commission report. Mandate. The commission should expand on Trump's commitment to explain the core convictions of Islamists (i.e., the full and severe application of Sharia), to expose their networks, and to develop new protocols for law enforcement. In addition, it should examine where Islamists get their resources and how these can be cut off; figure out how to deny them use of the Internet; offer changes to immigration practices; and assess how political correctness impedes an honest appraisal of radical Islam. Implementation. For the commission's work to be relevant, it must coordinate with federal agencies to gather data and craft recommendations, draft executive orders and legislation, provide supporting documents, prepare requests for proposals, outline memos to state and local governments, recommend personnel, and work out budgets. The commission's overall goal should be to bring Americans together around a common understanding of the enemy's nature. Finally, the commission should be prepared that its reports may be used as evidence in criminal proceedings, such as was the case several times in the past (e.g., the Warren, Rogers, and Tower commissions). The overall goal of the White House Commission on Radical Islam should be to bring the American people together around a common understanding of the enemy's nature, how that enemy can be defeated, and specifics to accomplish this objective. Perhaps this will start the long-delayed process of winning a war that has already gone on far too long. The United States has all the economic and military advantages; it lacks only a policy and a strategy, which the new administration, relying on a first-rate commission, can finally supply. Daniel Pipes (DanielPipes.org, @DanielPipes) is president of the Middle East Forum. Christopher C. Hull (IssueManagement.net, @ChristopherHull) is president of Issue Management, Inc.